We've had a week of nothing but rain here, preceded by a week of snow, but the sun is finally out this weekend! 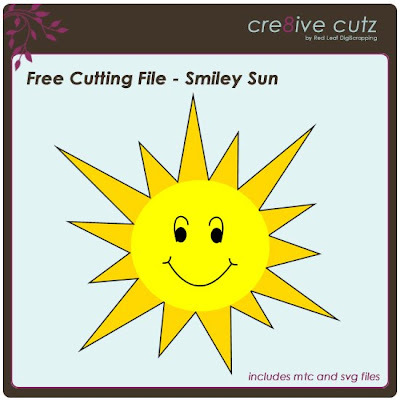 This smiley little sun is sure to add a spot of sunshiney happiness to your projects. 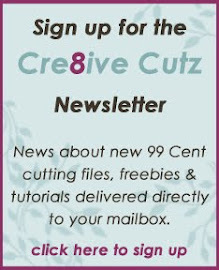 Click on the preview to download the cutting file. MTC and SVG files are included in the free download. Enjoy! Thanks for this sunny file! Thank you so much for this post. I want to let you know that I posted a link to your blog in Creative Busy Hands Cricut Freebies Search List, under the Elements post on Jun. 24, 2010. Thanks again. Beta version of the new Make the Cut! is here!